In the Chicagoland area, you can have your choice of some great Santas, but you should just start and hire the best Santa in the land, and that is Santa John Sullivan. 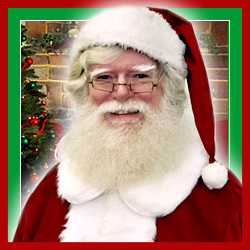 Santa John comes with many great referrals and testimonials – his rapport is genuine and warm with children of all ages, so to speak. This real beard Santa can do nothing short of making even the grumpiest individual believe in the enchanting magic of Father Christmas.